There are days when you do not want to cook elaborately but the taste buds demand for tasty food. An option would be to make a one pot meal, another option can be to order out but this time I did not do either of that, I utilized things in my refrigerator and did cook an wholesome combination. Today I am writing about a very interesting, extremely tasty and a healthy combo. A few days back when everyone in the family had left for school and office, I finished my morning chores and sat down quietly on my bed. My thoughts took me back to about 20 yrs back when I was still a school going girl and my Mavshi (maternal aunt) and cousins had come to stay with us at my Mom’s place and all of us had gone to see the dam. While returning back it rained heavily and we had fun in rain and then played antakshari while we drove back home. After reaching home, everyone was tired and the ladies in the house were surely in no mood to cook elaborately. My aunt initiated to cook and introduced us to this simple pilaf using Masoor while my Mom made the raita and fried some crispies. I was suddenly extremely excited remembering this Pilaf and wanted to try it immediately. Though my aunt had used masoor directly, I thought of sprouting them to make the preparation more healthy. Along with the pilaf I made S’s all time favorite Punjabi Dal Fry or Dal Tadka. Whenever we go to eat out in North Indian restaurants, DH prefers to order this and the last few times the dal was not up to his taste, so I decided to pamper his taste buds. The dal turned out extremely tasty and everyone was asking for more of it. S’s compliment was the best …he said, this beats any of these Punjabi restaurant preparation!!! So, if you are in a mood to try restaurant style, err sorry better than that dal fry, do try this, I will vouch for the taste! Pilaf is very light to eat and has no heavy flavors. We just loved it for it’s simplicity. 1. Heat oil in the pan and add the shahjeera, once it crackles, tip in the mixed spices and let them crackle. 2. Add the green chilies, followed by sliced onions ( I used 2 onions here, 1 onion was fried to garnish later). 3. Add the sprouts and mix properly. Also add in the salt as per taste. 4. Wash and soak the rice for 15 mins. Drain the water in a separate utensil and add this rice to the sauteed onions and mix lightly for about 2-3 mins. 5. Add the drained water and more water for cooking ( 2 parts water is taken for 1 part rice). Once the water comes to a boil, simmer the flame, cover the pan partially with a lid so that the steam can escape and the froth will not rise up. 6. Check it once or twice in between, ensure that the grains are not broken while stirring. Cook till done. Finally remove the pilaf in a serving bowl and garnish with fried onions and serve. 1. Heat oil and ghee mix and add the cumin. Once the cumin crackles, add crushed ginger garlic followed by kasoori methi. 2. Add chopped onion and saute till they are brown in colour (do not burn). 3. Tip in the chopped tomatoes and add the salt. Cook till they are mushy, now add the turmeric, red chili, coriander and cumin pwd, saute for a min. 4. Wash and soak the two lentils together for half an hour and then pressure cook it along with some turmeric and few drops of oil. When the pressure drops, add this dal to the onion-tomato mix. 5. Mix the dal properly with the mix and add a little water (about a cup) and bring it to a boil. 6. Sprinkle the garam masala and give final stir before serving. Serve the dal hot with the pilaf (if one wants, can put a spoon of tadka again on it, I did not do that). Sending this to ‘Only’ Cooking with Grains happening this month at Shruti’s place. 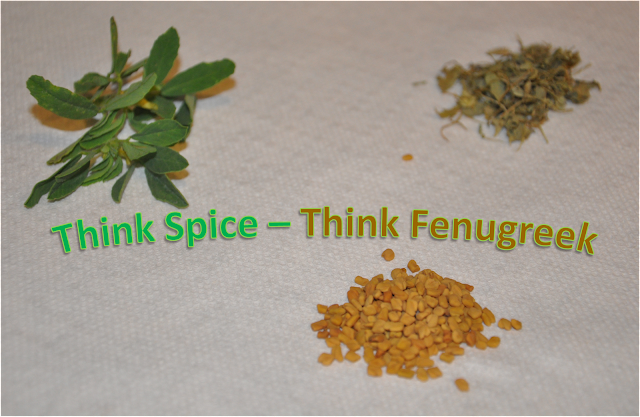 and the dal fry to Sunita and Priya Mitharwal’s Think spice-Think Fenugreek event. The dal should not be overcooked and grains should be visible. One can add a glass of cold water to the cooked dal so that the grains do not become mushy. The Shahjeera adds an amazing flavour to the pilaf, so do not avoid that. A dash of lime juice to the dal tastes really good. Wow I love this combination and dhal tadka is my fav.. this both is truely making me drool like anything.. awesome combo...yummy!!! Pictures are great pari. Hi Prathy, in restaurants the dal tadka is made either with tuvar dal or a mix,try this if u can, it's finger lickingly good and sprouted masoor are so good, I am surely gonna try many more recipes with it. Satya, Kasoori methi is a must in dal fry, adds in a lovely flavor, but one needs to add it consciously else the dal can taste bitter. Thanks Pavithra, I am truly overwhelmed that u liked the pics. Both dishes looks utterly delicious and irresistible, thick dal fry makes me hungry..
Love pilaf and dal dishes...they look so delicious, esp. the dal! hi there,ya u r right,i am in singapore,..combo looks yummy,...hows the weather there heard its raining quiet heavily there,..
Dal and pulav is such a basic combination, yet it can be made to taste so good! Your pics have come out so nice, especially the closeups! Sprouted masoor dal pilaf is healthy dish along with protein loaded dal thaddka wonderful Pari. Wow..delicious pilaf Pari..Drooling over the pictures.. I m loving it ! Sply the dal.. simple yet rich! I love them both, Yummy! Pilaf and Dal look incredibly yummy! thats a wonderful rice with delicious dal..
lovely and tempting combo would love to grab the whole thing and have it. Never heard of sprouting masoor dal. Looks so healthy and hearty. Delicious Masoor Sprouts rice and daal tadka.Love the combo. Am a sucker for dal fry, thanks for the recipe, the pilaf sounds simple and tasty, perfect with the dal. sprouted massordal,never heard abt that,but sounds very healthy. sprouted masoor rice is such a good idea..will try it next time.. I love the earthy taste of masoor dal. Haven't tried sprouting them before. Sprouts pulao is something I never tried.. your looks awesome with the daal.. bookmarked it ! lovely clicks too.. I made a one-pot meal with cracked wheat and sprouted masoor. Your combo is indeed droolworthy. Dal tadka is making me feel hungry now. pari both the dish looks so delicious.. the pilaf is my favorite.. very healthy one dear.. very well explined and lovley pics.. Very nice dish indeed ..No matter how I try to make a Punjabi style Tarka , it never tasted like the Dhaba ones. Thank you very much for visiting my blog and y0our nice comments..Nowadays cant on all the blogs even if I read all. This is mainly because of lack of time. My compu is always on..but rarely sit on it ..so thats why you dont see me on line. Looks delicious,specially dal fry. Howevr, can you share how in the restaurants the dals have amild smoky flavour. I just love that !!!!! !